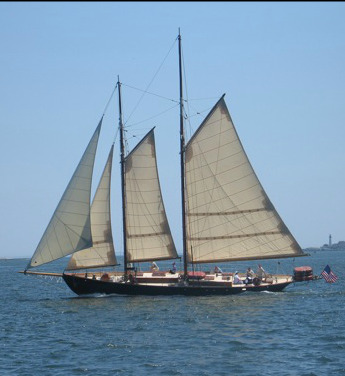 The schooner Bagheera was designed by John G. Alden and built in 1924 in East Boothbay, Maine. Shortly after launching, she sailed in the Bermuda Race, and then spent the next 50 years sailing in the Great Lakes. Bagheera was entered in the Chicago Mackinac Race numerous times, winning in 1930. The vessel was sailed to the Caribbean in the 1970s, eventually finding her way to the Galapagos Islands. She was converted to the passenger trade in the 1980s. She then sailed out of Los Angeles, San Diego and San Francisco before being shipped to Maine in 2002 to serve Portland Schooner Co., her current stewards. Today, Bagheera sails Memorial Day through Columbus Day from the Old Port in Portland, Maine, offering a variety of educational courses, public sails, and private charters.